The premise for this series was intriguing and I couldn't resist especially with a guaranteed happy ending. I liked our heroine and hero, Pallas and Nick. They were flirty, fun, and interesting. Pallas felt unworthy of love, believed that it had to be earned, thanks to her demanding, impossible-to-please mother. Nick on the other hand is afraid of love, specifically love that consumes a person, thanks to his mother and father. Slowly they came to realize that love is not earned but freely given and that it need not be all consuming, that it can and does extend to and include other people. The story was slow at times, with a little too much back story at times, but it was character driven, focused on the people in the stories. Although some of the characters first appeared in the Fool's Gold series, which I still haven't read, the story works as a stand alone. I imagine, though, that there are spoilers for that series in this book (and future books). 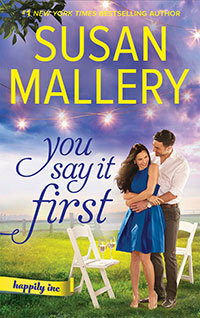 "You Say It First" was a sweet, interesting romance in a unique and fun setting. "Second Chance Girl" picks up not too long after "You Say It First" and focuses on sisters, Carol Lund, gamekeeper, and Violet Lund, button connoisseur. Each has had feelings for a man for years, and each finally gets the chance to act on those feelings. Carol and Mathias, who is the brother of Nick from "You Say It First", have known each other for several years, they are neighbors and acquaintances. Violet had a school girl crush on Ulrich, a British lord, as a teen and meets him again as an adult. It wasn't quite a meet cute as he angrily accuses her of theft when they encounter each other. Ooops! Just as in the first book, there's a wedding at the center of the story so we get the two romances and a wedding (not either of the sisters). This book moved at a slightly faster pace than the first book but was also a bit less focused, trying to cover the romances, the wedding, a herd for Millie the giraffe, and some family drama. The family drama, which encompasses Mathias and Nick's family, seems to be a series arc, and apparently began during the Fool's Gold series. Mallery gives us sufficient information about it to understand the family dynamics. Family can be exhausting and frustrating and oh so challenging and a source of great pain. But Mallery also shows us that family, whether of blood or choice, can be a source of love and comfort and support. Carol and Mathias's romance gets more time than Violet and Ulrich's which was unfortunate as Violet and Ulrich's relationship happened quickly and could have used some more development. It was a sweet romance, they were cute together, but it lacked depth. It really should have had its own book pr novella. Mathias and Carol's romance was bumpier with each thinking the other is uninteresting and then a doozy of a misunderstanding. But once they sort things out they really heat things up. The supporting characters again were a joy and are a highlight of the books. Also, I love the Boardroom Pub and its collection of board games and its game challenge nights. For a small town, Happily Inc has a fun nightlife. 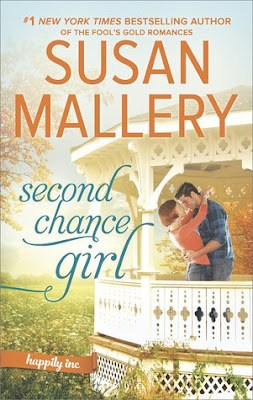 :) And I loved the preserver - the idea of it, learning about it, and how it fits it into the wedding business in Happily Inc.
"Second Chance Girl" was another delightful story in this series. Bring on more Happily Inc stories!